I WENT TO THE Marché aux Puces at Porte de Clignancourt on Saturday, the largest flea market in the world so they say. I was on a mission, hunting for sounds and particularly for the sound of a rag and bone man. In the late nineteenth-century, the area around Porte de Clignancourt was awash with rag and bone men, known as chiffoniers in French or sometimes, more poetically as, pêcheurs de lune, moonlight fishermen. Why I need the sound of a rag and bone man is a long story but let’s just say that it wasn’t my most successful sound hunting day. Not surprisingly, there wasn’t a rag and bone man to be found. Nevertheless, the day was far from wasted. 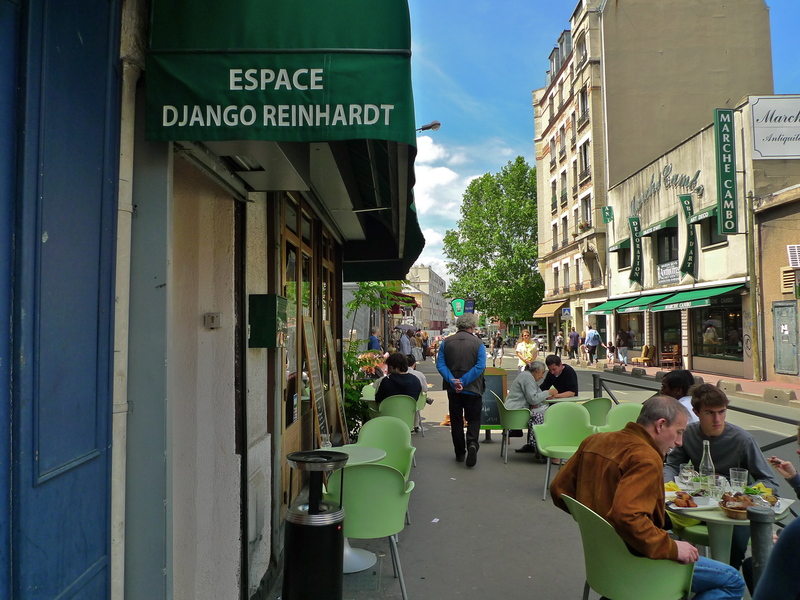 On my travels I came upon what appeared to be an ordinary café in the Rue des Rosiers. I should have known better. Few things in this city are ordinary. 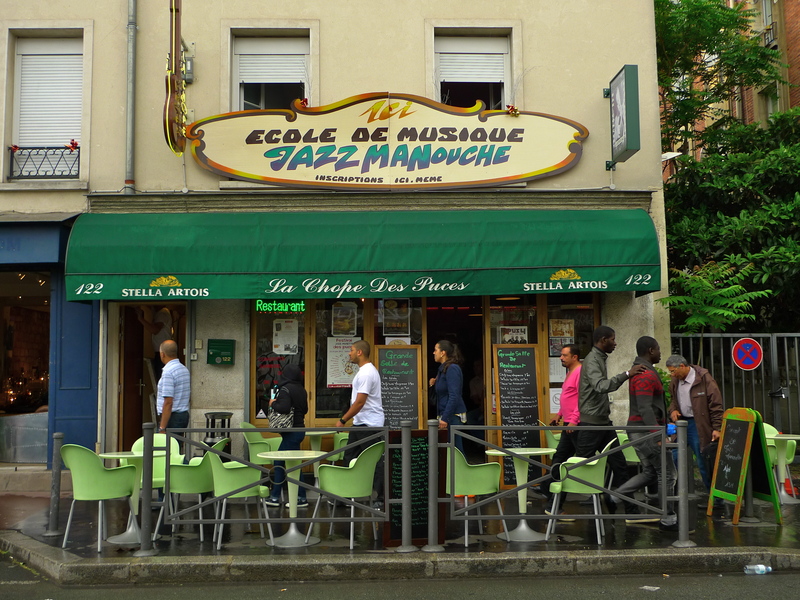 This is the celebrated Chope des Puces de Saint Ouen, a restaurant, a concert hall, a music school, a recording studio, a shop selling musical instruments and above all, a temple to jazz manouche, gypsy swing or hot club jazz, inspired by the magic of Django Reinhardt. If you happen to be in Paris between the 22nd and 25th June this would be a good place to visit since the Festival Jazz Musette des Puces is taking place. Also taking place at the moment is a wonderful exhibition in the Marché Daupine. “Hifi Génies” is an exhibition specifically designed to send sound nuts like me into a state of rapture. It includes a selection of equipment covering the history of sound reproduction. 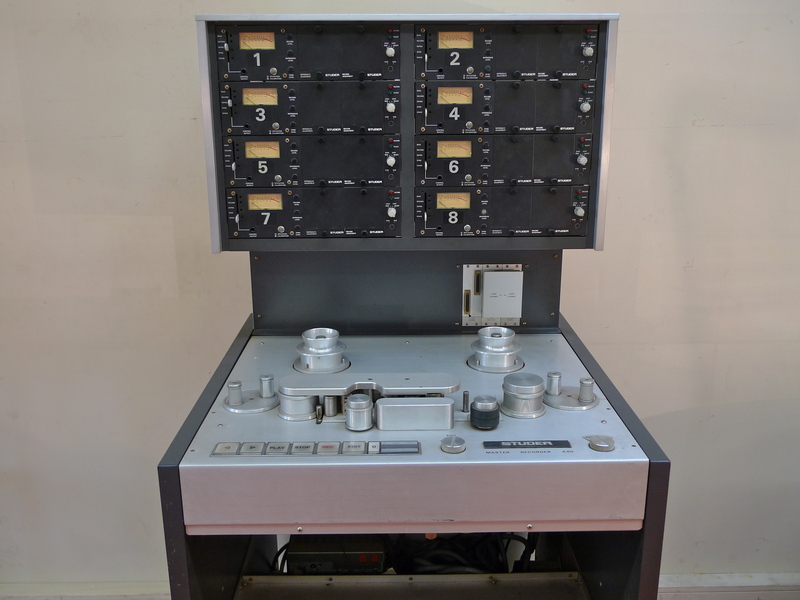 As always, it was the tape recorders that captivated me, ones like these studio models from Ampex and Studer. 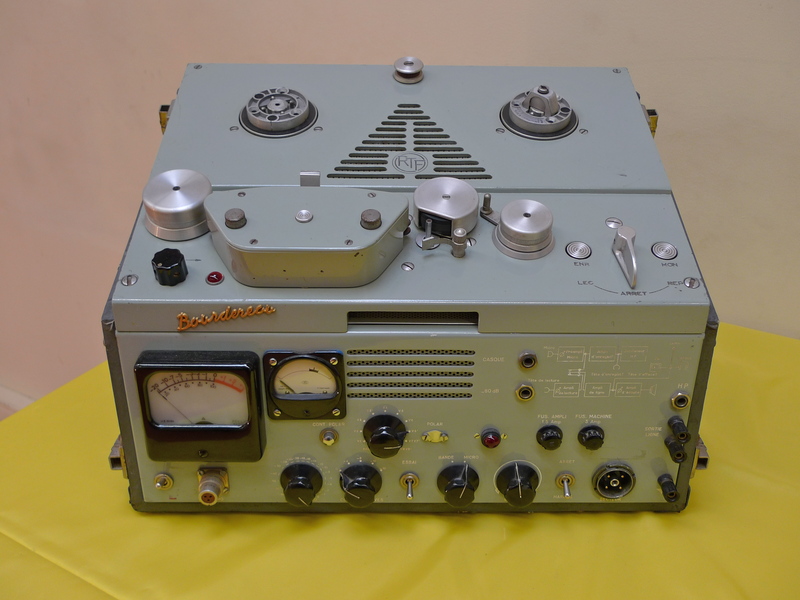 And this one made by the French company Bordereau and used by the French national broadcaster RTF (Radiodiffusion-Télévision Française) in the 1950’s. There were other tape recorders on show including Revox, Pioneer and some cassette recorders as well as some other Hi-Fi equipment but undoubtedly, for me at any rate, the stars of the show were these three beauties from Nagra. The Marché aux Puces comprises fourteen individual markets with around three thousand individual shops and stalls. It sells everything from complete junk to eye-wateringly expensive antiques. In every narrow alleyway and round every corner a surprise lies in wait. But few surprises could please me more than finding the Espace Django Reinhardt and three classic Nagra’s on the same day. I think the search for a rag and bone man can safely wait for another day. For those of you who wonder what all the fuss is about when it comes to tape recorders, thank you for getting this far and I hope you at least enjoyed the music from the Espace Django Reinhardt. 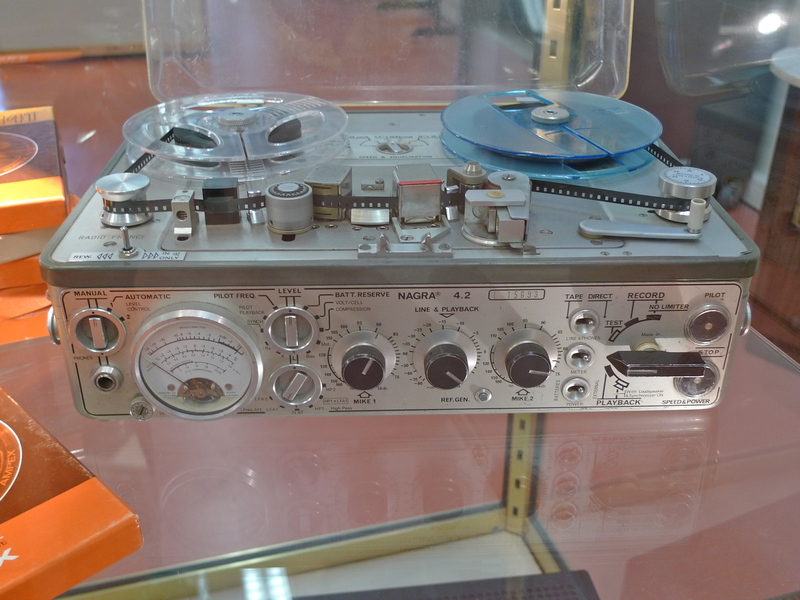 For those slightly crazy people like me who find reel to reel tape recorders, and especially Nagra tape recorders, things of wonder and endless enjoyment you can find more Nagra recorders here … and here. Enjoy! THIS POST IS DEDICATED especially to those interested in the technical aspects of sound recording and sound recording paraphernalia. Not everyone’s cup of tea I know so, for those of you who regularly follow this blog for the Parisian street sounds, I have included something for you too. Yesterday, I went to the Marché aux Pouces at Porte de Clignancourt – the flea market to beat all flea markets. 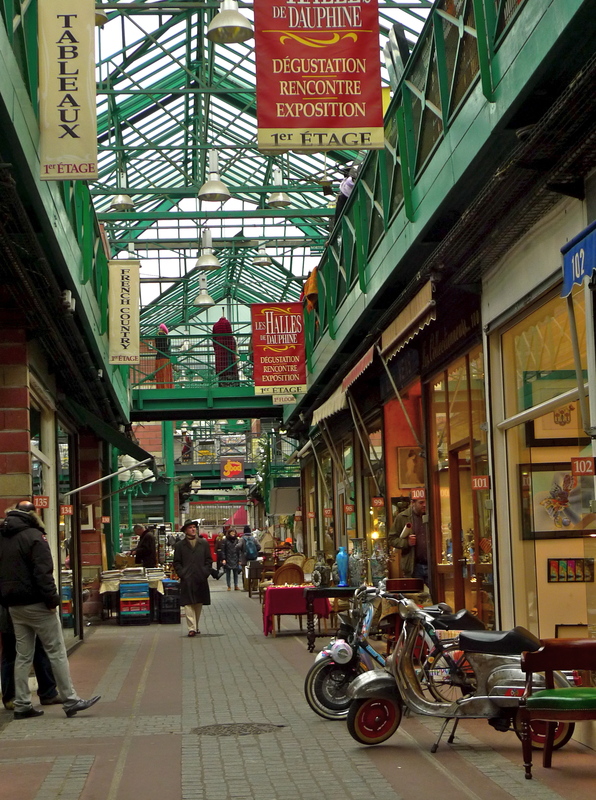 The Marché aux Puces is actually a collection of individual markets centred around the rue des Rosiers area. 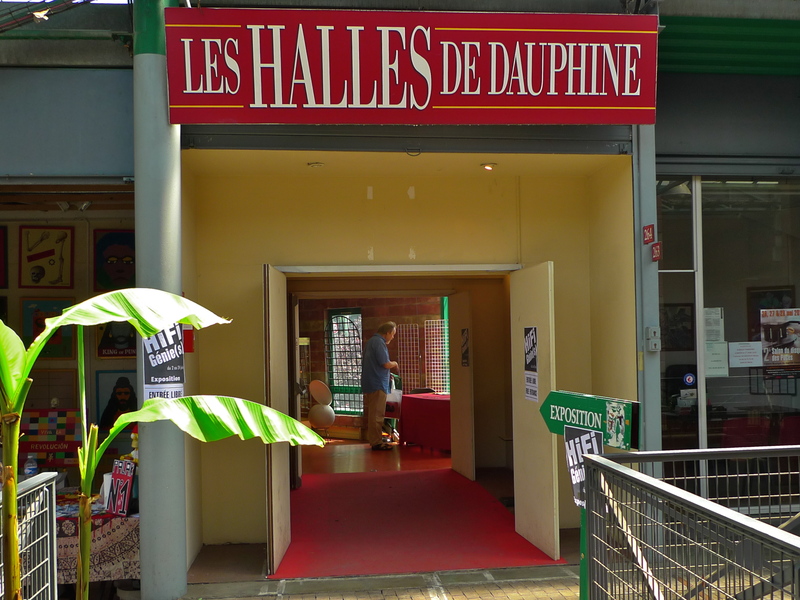 I like all the markets there but my favourite is the Marché Dauphine, a large, two-storey, covered market, less ostentatious and less expensive than the Marché Biron but a cut above the outdoor Marché Vernaison both of which are close by. 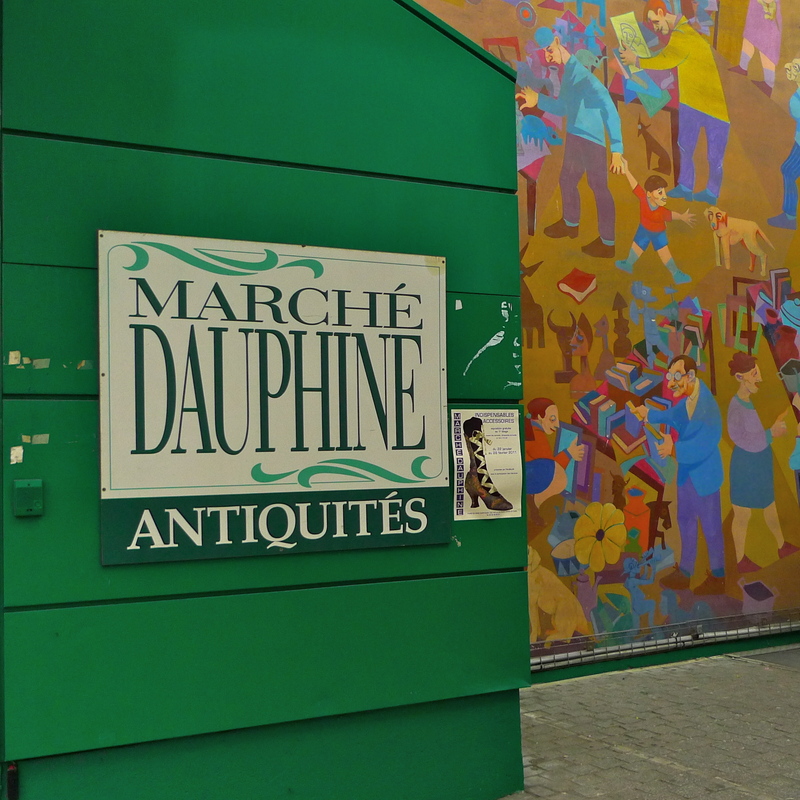 The Marché Dauphine just seems to have more things that interest me – and more things that I can afford! All markets are I suppose a voyage of discovery – you start by looking at one thing and then get sidetracked into looking at something completely different. And so it was yesterday. I spent a long time in the wonderful section on the first floor dedicated to old prints and photographs which was indeed a voyage of discovery. I could have happily stayed in there all afternoon – but I’m pleased I didn’t because my next discovery simply made my day. It’s hard now to remember just what a groundbreaking tape recorder this was in its day. 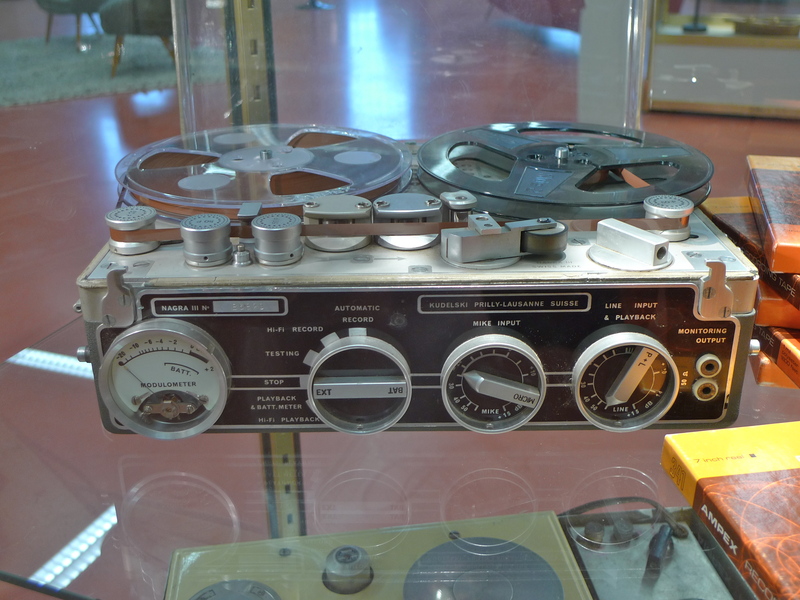 It was the first Nagra tape recorder suitable for use with film and consequently it took Hollywood by storm. Stefan Kudelski, who founded the Nagra company, had examined several systems for synchronizing the film camera with the tape recorder. 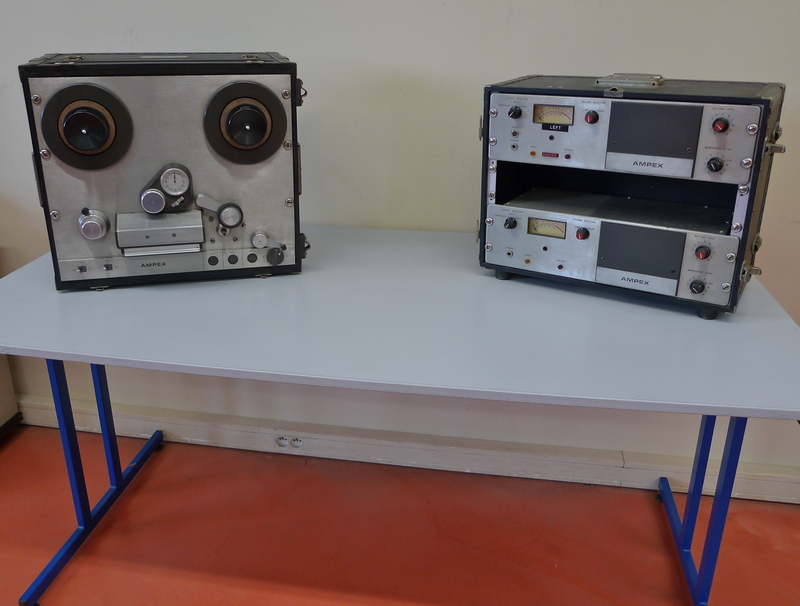 One such system worked from a signal generated by the tape recorder which then slaved a rotary converter feeding a synchronous motor on the camera. This method had disadvantages and it was very wasteful of power. At that time, power transistors were not sufficiently developed to allow the elimination of the rotary converter so the method he finally adopted was the reverse of this recorder to camera method. In the new method, the camera generated a signal which was recorded on the same tape as the sound, thereby reducing the power consumption enormously. From 1956, Kudelski researched into the possibility of a self-contained tape recorder without a centrifugal speed governor, this latter causing endless trouble with the clockwork drive. 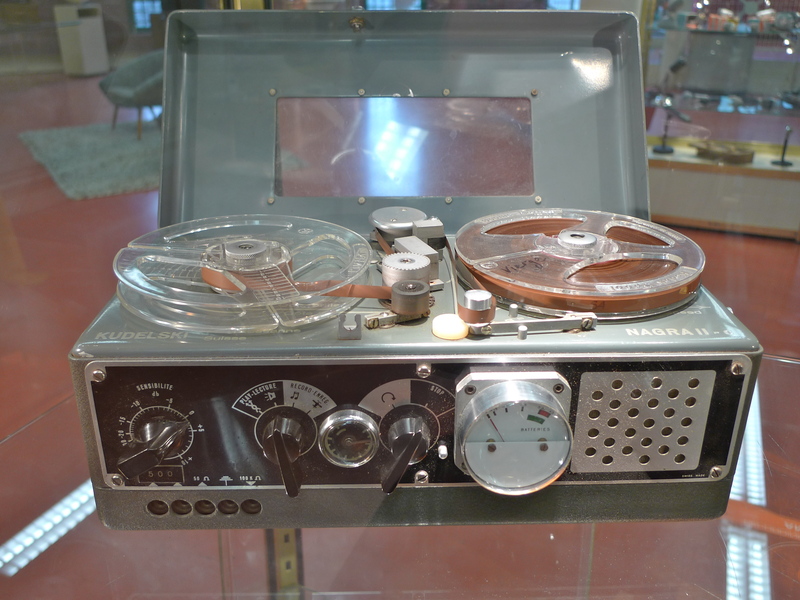 This resulted in the Nagra III, which was launched in 1958. 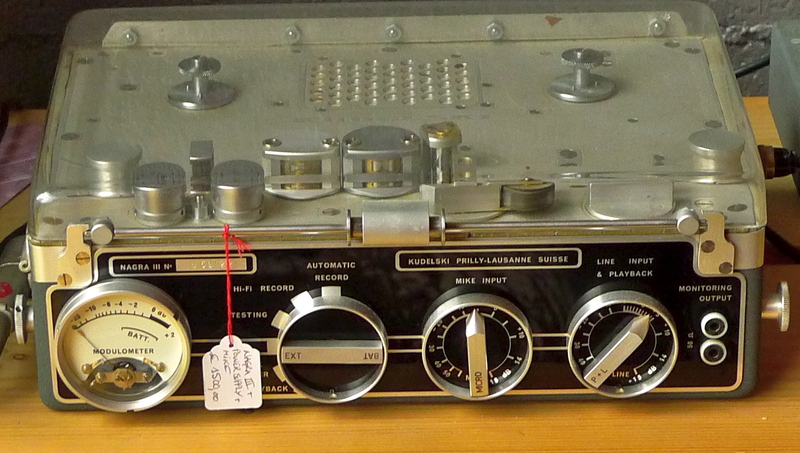 The feature that gave Nagra the edge in quality and film use was Kudelski’s development of the Neo-Pilottone system, where the synchronisation data could be recorded on the tape in the middle of the audio track, but without crosstalk onto the program recording. The frequency of the pilot signal was 50/60 Hz and was often derived from the mains. The signal was recorded as a twin track signal 180° out of phase so as to be invisible to the full track playback head. The start point was indicated by the clap of the film clapperboard and the synchronization to the magnetic film was maintained using the pilot signal throughout the take. Neopilot, as it became known, was the standard synchronization system used in filmmaking until the late 1980s, when timecode became the preferred standard. 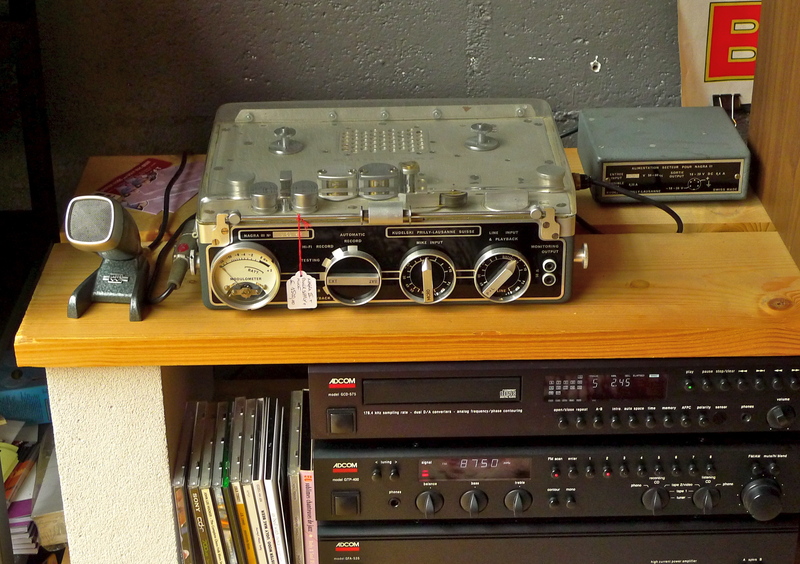 So there we are, the Nagra III, an icon of its day – living history in the Marché aux Puces at Porte de Clignancourt. And alas, there it remains – at least for the moment! I hope it gives others as much pleasure as it gave me yesterday afternoon.